Q: When will the Cobra SRX8E be released ? 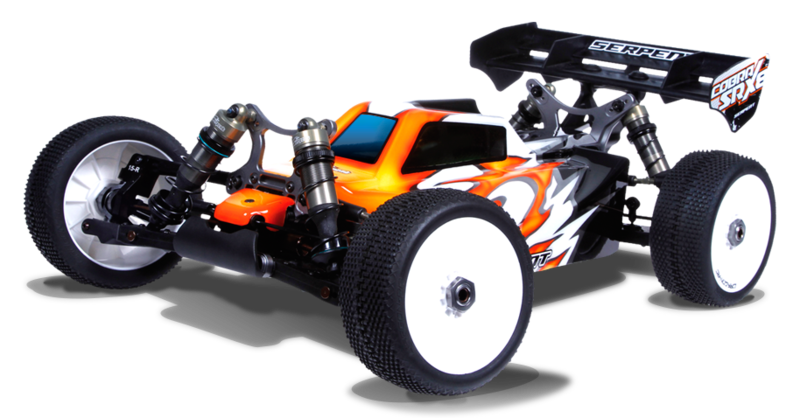 BE: The Cobra SRX8-E will be released start may 2017. Q: When did you start on the actual design of this car ? BE: The design phase of the SRX8-E started in March of 2016. Q: When did you first got to test the final proto-type and how did that go and were still changes needed after ? BE: The first prototype , consisting of 3D printed parts and machined parts was late 2016 and then the first operation-able sample came in early 2017. Q: Did you already race the final SRX8-E at some official events ? BE: Yes, I actually tested the SRX8-E at a couple of local events under the radar, and then the first major race I ran it at was Dirt Nitro Challenge, Silver State Nitro challenge and then the PNB. Q: Does the SRX8-E share many parts with the GP version ? BE: The SRX8-E version shares pretty much the front and rear end assemblies, and also the differentials. The only parts that are mainly different is the center section, pods, motor mount, braces and speed control mount. So for drivers that run 2 classes its super easy that so many parts are equal between GP and EP versions. Q: What do you feel are the 5 main new design elements each with a brief explanation ? BE-1: I think the most important element is the ability to change the layouts from block to saddle, and then use basically any battery in production in either car. It think this is a huge advantage for customers, as they can re use any battery they have ever had. ( The saddle layout is not included in the kit, but sold as optional, consisting of only 2 centre shafts and saddle battery-boxes ). BE-2: The left to right balance of this car is actually superb. No matter the battery layout, you chose, the left to right side balance is actually very, very close, which will help the car to corner more even and consistent left to right. BE-3: The speed control is mounted in the front of the car, which will enhance the life of your electronics, and can easily be removed along with the servo, to make maintenance and cleaning an absolute breeze. BE-4:The simplicity of construction, less parts, lighter weight, and less things that can break or go wrong. BE-5: The CG is considerably lower than most of the other cars on the market, which will be a huge advantage when you get into higher grip tracks. Going to a lighter overall construction of parts, and then using a 4mm chassis, gave way for many areas of improvement, which have so far shown excellent in my testing. Q: Which of the 2 possible layouts will be most popular you think, and do you believe each has certain advantages on specific surfaces ? BE: At the moment, I have had really great success with both layouts. I have run them both in low and medium grip conditions. I would feel though there could be a considerable advantage to both layouts in high or low grip. I assume, that the block will perform better, from a medium to high grip, while the saddle could perform better from the lower grip to med. It is tough to say for sure, though as I have not been able to test the two layouts in a large enough sample size of conditions to be 100% sure. Q: Which are the key team drivers to race and promote the SRX8-E this season ? BE: We have some really talented drivers, that use the product. The core group of guys running the SRX8-e would be, myself, Jorn Neumann , Austin Woodyard, Justin Fales, Griffin Hanna, Adam Johnson, Paul Ciccarello and many others. Q: Will you be racing this new car at some big events this year too ? BE: Yes, I will try to be as active as possible and try to support the SRX8-E , whenever possible. I love the car, and hope that customers will get to experience it themselves to see how well it performs. Thanks for the information /answers !